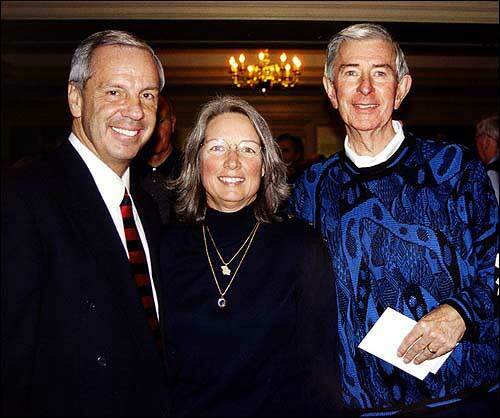 Kansas University basketball coach Roy Williams and his wife, Wanda, join Bob Billings during a January 2002 event to honor Billings and his many contributions to KU. The event was at KU's Adams Alumni Center. Kansas University lost one of its biggest supporters Thursday. As a student and as an alumnus, Billings was an important supporter of many KU endeavors. His generosity to the university was noted also by other KU leaders both past and present. Billings came to KU as a Summerfield Scholar and a member of the basketball team. He was a student leader in high school, and that continued at KU, where he majored in economics, business and political science. Billings was elected student body president in 1958 and was president of Alpha Tau Omega social fraternity. The national fraternity named Billings its outstanding undergraduate in 1959. While at KU, Billings was vice president of the Sachem senior men’s honor society, a member of Phi Beta Kappa and a KU Hilltopper, the top student award for graduating seniors. In addition to his leadership role, he was a guard on the KU men’s basketball team, including the notable 1957 squad that made it to the NCAA finals. That team also included Wilt Chamberlain, with whom Billings maintained a lifelong friendship. He received All Big Eight conference honorable mention honors in 1958, and, in 1959, received the Forrest C. Allen award given to the KU senior athlete with the highest academic standing. Dr. Lynn Kindred, now a cardiologist at KU Med, played basketball with Billings and kept in touch. KU men’s basketball coach Roy Williams said Billings’ death would be felt beyond KU athletics. Billings was a sophomore at KU when Emily Taylor arrived there to begin her job as dean of women. Billings’ sense of humor also was part of Taylor’s memories. Billings was honored in 1984 with the Ellsworth Medallion, the KU Alumni Association’s highest honor for “unique and significant service to the university,” and in 1988 with the university’s Distinguished Service Citation. He served on the KU Alumni Association Board of Trustees and was a donor to the Williams Fund and the KU Endowment Association’s Chancellors Club. He also supported many other university efforts including the Spencer Museum of Art, Lied Center and the new Dole Institute of Politics. Bob Dole, the former U.S. senator from Kansas, lived across the street from Billings in Russell. “Bob was younger than me, but I watched his high school basketball progress and then his playing at KU. I kept track of him over the years,” Dole said. Richard Norton Smith, director of the Dole Institute, noted that Billings, his wife, Bev, and his brother and sister-in-law recently pledged money for a stone map of Kansas for the floor of the institute’s entrance.